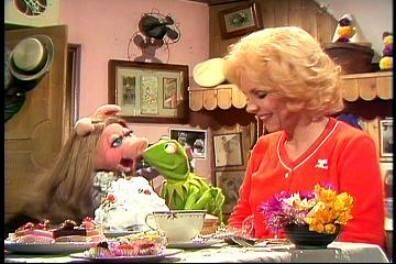 Teresa Brewer with Miss Piggy. 1950s गाना तारा, स्टार Teresa Brewer with Miss Piggy in an episode of The Muppet दिखाना in the late '70s.. Wallpaper and background images in the Rock'n'Roll Remembered club tagged: teresa brewer rock'n'roll 50s music 1950s singer miss piggy muppet show photo. This Rock'n'Roll Remembered photo contains छुट्टी रात्रिभोज and छुट्टी का खाना. There might also be चोली, ब्रासेरी, गुलदस्ता, कंचुकी, कहावत, फूलों का गुच्छ, चोली, पॉसी, नाकगेय, ब्रोच, nosegay, तुर्की डिनर, and टर्की खाने.